Jermain Anderson sees red in the home match with Walsall. Photo: Joe Dent/theposh.com. Peterborough United are the disciplinary bad boys of League One. Midfielder Chris Forrester became the eighth Posh player to be dismissed this season in yesterday’s (April `9) 1-0 League One defeat at Barnsley. Ricardo Santos is shown a second yellow card in the game at Chesterfield. Photo: Joe Dent/theposh.com. Only Chesterfield can match that total, but Posh have the worst overall disciplinary record by some distance according to the FA’s ‘fairplay’ table. 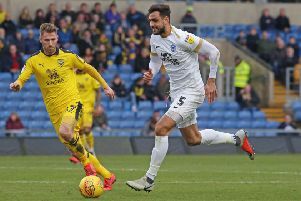 Posh have collected 114 cautions in all competitions, 15 more than any other League One team, and under the FA’s totting up procedure Graham Westley’s men have 100 more disciplinary points than the second-worst offenders, Millwall. In compiling their ‘fairplay’ table the FA award four points for a caution, 10 points for a red card awarded for two yellow cards or a denial of a goal-scoring opportunity and 12 points for a red card issued for serious foul play or violent conduct. The other Posh players to have been sent of this season are Ricardo Santos (twice, both times for two yellow cards). Gaby Zakuani (serious foul play), Jack Baldwin (serious foul play), Michael Smith (two yellow cards), Jermaine Anderson (violent conduct) and Erhun Oztumer (serious foul play). Michael Smith collects his second yellow card of the game at Chesterfield. Photo: Joe Dent/theposh.com. Forrester was dismissed for picking up two yellow cards. Anderson’s act of ‘violent conduct’ was laughably for throwing a water bottle by accident into a handful of unconcerned Posh fans! Walsall are the only League One team not to have had a player sent off.